On the sea of Cesenatico, safety for children with the private beach! The 3 star Roxy Hotel & Beach is perfect for guests seeking the very best in relaxation and entertainment for their holiday by the seaside in Romagna. The hotel’s many services and the warm management style of Marco, Romina and their family make it an ideal choice for guests with children (as well as other guests too, of course). By simply exiting the hotel and walking down a short private path you will reach our private beach, or should we say “your” private beach? Without having to cross a single road, you will find yourself in the place you had been longing for, and finally you’ll be able to start your holiday by the seaside! Our position, our swimming pool, our services for children and great attention to every detail, as well as the enthusiastic style of our hotel management, make us a perfect hotel for families, as proved by our affiliation with the Italy Family Hotel consortium. Our swimming pool is a paradise for adults and children alike. Its two different depth levels make it ideal for everyone. It also hosts the afternoon activities of our mini-club, and is the perfect location for many other entertaining moments. The 3 star Roxy Hotel & Beach is an ideal choice for all-inclusive holidays in Cesenatico: the full board formula in our restaurant (drinks included) is further enriched by use of our private beach and free parking. All you need to bring is your enthusiasm, we’ll take care of everything else! Stay as long as two weeks in Cesenatico, as you will never run out of things to do and to see: besides enjoying the local beach life, you’ll have the opportunity to take exciting trips in the surrounding area or visit the many theme parks of the Romagna Riviera with your children; in the case of Atlantica di Cesenatico, we can even give you free tickets! "This family-owned resort is big fun for families with young children. 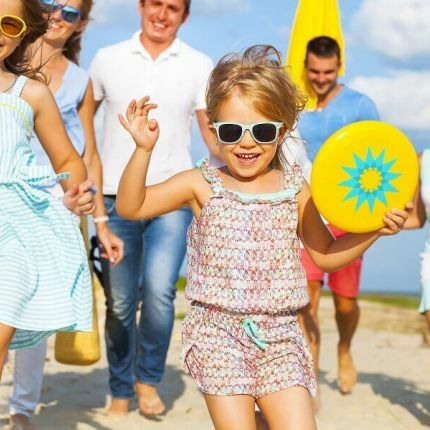 Sandy beach, calm ocean, beach chairs and an umbrella reserved just for you, and a "mini club" where the Roxy staff help keep the kids entertained with lots of fun activities. The owners are so welcoming and make you feel at home. You can explore the town on the Roxy's beach bikes! We loved our stay here! If you're going to Cesenatico with kids, the Roxy is the best! About the town of Cesenatico: English speakers should learn at least a little Italian before you go. You won't find English speakers everywhere here -- unlike in the big cities." Our family for your family. Everything will be great during your holiday in Cesenatico!